Order your NBI Inc LP910 refill toner on our TonerTopUp website now! The NBI Inc LP910 is one of a range of models sharing a common "engine". These may be badged by different manufacturers. They have the following range of cartridges. Do not be concerned if the refill toner for your NBI Inc LP910 has what appears to be an unrelated name. This is because of the sharing of the engine between different makes and models. These are general instructions for this fill method. We supply specific instructions for the majority of printers with the toner. This is a straightforward and quick way to refill. First of all prepare your worksurface. Working in an area of subdued light, cover your work surface with some newspaper. You may choose to wear latex gloves or use a dust mask. Take care not to touch or damage the imaging drum on the bottom of the NBI Inc LP910 toner cartridge. Greasy marks or nicks in the surface will ruin the print quality. The filler cap is hidden under the removable end panel. Unscrew the end panel from the side of the cartridge. Put the screws somewhere safe. Remove the end panel. Locate and remove the round plastic plug on the side of the NBI Inc LP910 toner cartridge with pliers or a flathead screwdriver. Carefully avoid damaging the plastic around the edge of the hole. Push the flathead screwdriver under the lip of the filler cap and lever it upward. Work around the edge of the filler cap until it pops out. Pour slowly into the toner chamber and be careful not to squeeze the bottle hard. Leave an air space at the top. 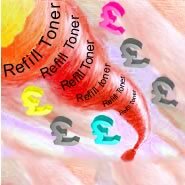 We may supply more or less toner in the bottle than your cartridge can contain. Do not overfill. Ensure that there is at least 5cm of space above the toner with the cartridge upright on its end. Wipe any loose toner off the outside round the hole with a duster and then close the hole with the filler cap so that it does not leak. You may like to test the seal by holding the cartridge above a sheet of white paper and gently shaking it. If some toner leaks, stick brown vinyl packaging tape around the edge of the filler cap. Replace the end panel and screws. Note that you have done nothing to disturb the cartridge so if it had packed up because it had run out of toner you should have it back in action without affecting any components. We suggest you always have at least one spare refilled cartridge ready to be used in your machine as you do not want to have to refill a cartridge in the middle of a print run. We also suggest that you always have one spare new OEM or remanufactured cartridge as well. Your refilled ones will go on beyond their first life and will save you money.......but they will not go on for ever! Sooner or later something will deteriorate inside and you will need to start another one. Click here to view information on our products for the NBI Inc LP910 and to order!